The pound is below $US1.29 for the first time since 2017 and falling against the euro and yen. Sterling’s price is suffering from ongoing concerns about a potential no deal Brexit. Analysts say the currency’s poor performance is likely to continue in the short-term. 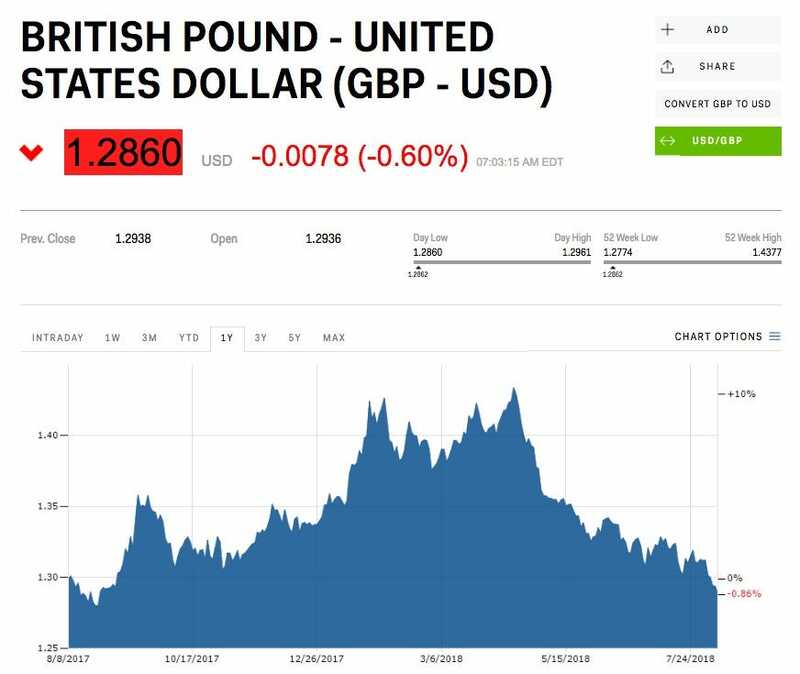 LONDON – The pound fell below $US1.29 for the first time since September 2017 on Wednesday as fears about a possible no-deal Brexit continued. Sterling is down 0.6% against the dollar to $US1.2860 at 12.00 p.m. BST (7.00 a.m. ET). It marks an 11-month low for the pound against the greenback. The pound is also down 0.58% against the euro and down 0.86% against the Japanese yen. Traders are concerned about a no-deal Brexit, which would see Britain drop out of the European Union without an agreement on future trading relations with the bloc. This would likely cause huge disruption for everything from food to medical supplies in the UK. The deadline for Britain to leave the EU is March 2019. The UK government has so far made little progress in agreeing on a post-Brexit trading deal with the EU. Bank of England Governor Mark Carney and UK International Trade Secretary Liam Fox have both warned about the rising likelihood of a no-deal Brexit in recent weeks. The pound has fallen almost 2% since the start of August and Otunga warned it is likely to stay under pressure for the rest of the week at least.